Rescue workers are searching for survivors feared buried in a landslide in south-western China that has left at least 72 people missing. On Friday afternoon, millions of cubic metres of rock collapsed on an iron-ore mine and several homes in a valley near Chongqing city. Twenty-six people have died, state TV reported. Eight have been rescued. Recovery efforts were being hampered as heavy machinery cannot be used on the unstable terrain, officials said. Further rain is also expected in the region, slowing the work of some 500 rescuers who have been drafted to help. Rescuers told state news agency Xinhua that they were hopeful of finding 27 miners who were underground at the time, but that prospects for those buried on the surface were not good. 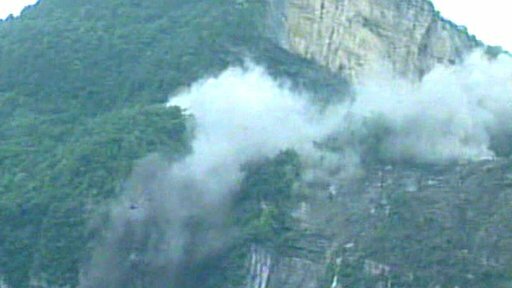 The debris covered an area 600m long (2,000ft) and 300m wide in a valley at Jiwei Mountain, Xinhua said. Some houses are buried 40m beneath the slide. Rescue workers are also digging a canal to drain a lake that was created when the landslide blocked a river. President Hu Jintao and Premier Wen Jiabao have ordered the local authorities to "spare no effort", Xinhua reported. China's mining industry has a poor safety record, with thousands of deaths reported every year. A similar landslide in Shanxi province in northern China last year killed 254 people when a dam holding back waste from an illegal mine collapsed, flooding a community. It is not clear what caused the latest incident, but an official with the Chongqing work safety supervision bureau told Associated Press news agency that the landslide did not appear to have been caused by the work at the mine.